“If you’re afraid of butter, use cream.” This is one of my favorite quotes from Julia Child, and I appreciate her message of enjoying food, and life, whole-heartedly. She knew how to live! Julia Child has inspired generations of us to start cooking, copies of Mastering the Art of French Cooking gracing our kitchen counters with its familiar fleur-de-lis pattern. This week would have been her 100th birthday, and what better way to celebrate her than to cook! To honor her, I wanted to do something quintessentially French, like a soufflé or quiche. 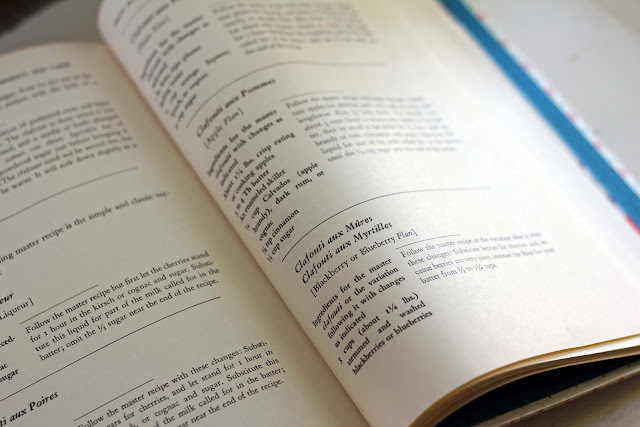 As I turned the yellowing pages of Mastering the Art of French Cooking (my copy comes from a used book shop), past omelettes and gratins, quenelles and terrines, I knew I’d found what I had in mind when I arrived at the clafouti, or fruit flan. Clafouti reminds me of a lovely French exchange student, Lise, that we became close with a number of years ago. She made one with apples for a potluck that was simply stunning (and scrumptious). A traditional clafouti is made with cherries, but Julia Child shares other fruit variations, including one with blackberries. 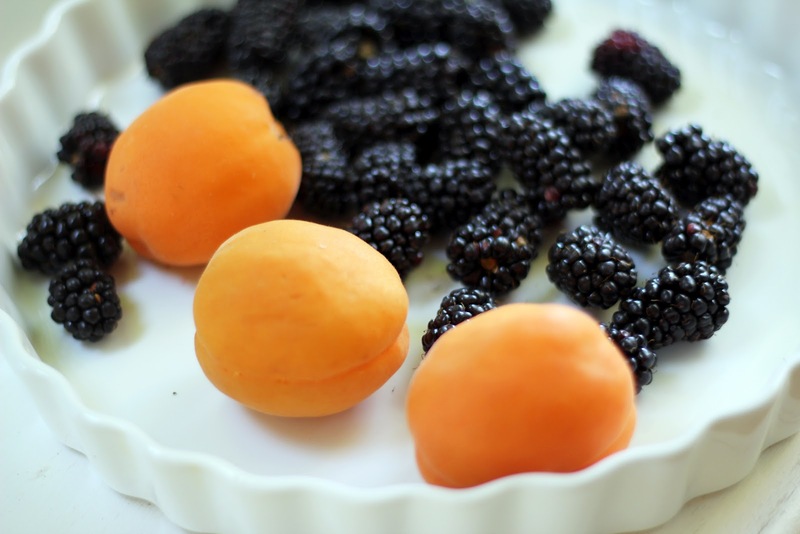 Blackberries are in abundance here right now and I had a few apricots in the fruit bowl, so I paired them together. 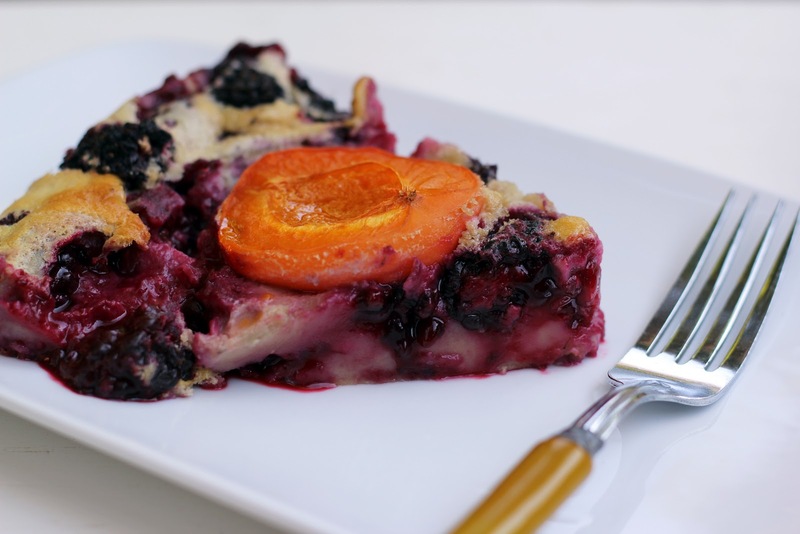 A clafouti is quick to prepare, just a whiz of ingredients in the blender to create a pancake-like batter, which is then poured over the fruit before baking. When I pulled the clafouti, puffed and beautiful, from the oven I let out a happy sigh. Taking my first bite made me sigh again. Thank you, Julia. The thick, tender flan is studded with fruit, warm and soft and slightly sweet. 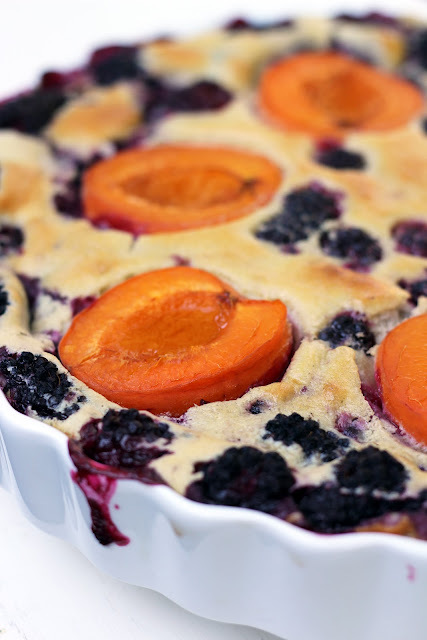 The blackberries and apricots evoke summer, and come fall I plan to make it again with apples. I can tell you, clafouti is also delicious straight from the fridge for breakfast! I showed enormous restraint in saving some for Bob and Sam when they returned from their weekend of fly fishing. Isaac is still away at camp until tomorrow, though...I don’t think I can last that long. Perhaps I’ll welcome him home with a blueberry clafouti. Preheat the oven to 350 degrees. Butter a 7-8 cup pie dish or baking dish (I used a quiche pan). In a blender, whiz the milk, sugar, eggs, vanilla, salt and flour together on high speed until smooth, about 1 minute. Pour a 1/4 inch layer of the batter into the prepared baking dish and pop in the oven for 2 minutes. Remove from the oven and scatter the berries evenly over the batter. Lay the apricot halves, cut side up, over the berries. Pour the remaining batter over the fruit and smooth. Bake for close to 1 hour, until it is puffed and golden brown. Dust with powdered sugar and serve warm for dessert or brunch. Yum! I want to make this right now! Thanks for the recipe Hannah. I agree with you Hannah, Julia Child was and continues to be an inspiration to those who love to eat good food. This recipe was a great pic and I'm going to see if I can tweak it to make it gluten-free. Great pics too. Thank you, Chef Moji! Julia Child was truly one of a kind. The clafouti is more eggy-like in texture, so I think you should be able to modify it to be gluten-free without problem. You can decrease the flour amount (the original recipe calls for 2/3 cup, but recommends increasing the amount due to juicy berries) and perhaps use a combo of potato starch and rice flour. I'll bet some almond flour would be delicious in it, too! Let me know how it turns out. We are on the same wavelength this week. I just posted a Julia recipe too. Your clafouti looks delicious. I like the combination and the pictures are beautiful. Thank you so much, Penny! Good to know we are sharing in the spirit of Julia. I'm popping over to check out your Julia recipe. Thank you, Brooke! I couldn't agree with you more. And you sent me hurtling back in time thinking about Bob Ross...oh wow. That Julia quote is perfect. Just catching up on all your posts as summer has been so busy. Love the look of that clafouti! Thank you, Lisa! Julia left us with so many marvelous quotes, didn't she? Hope you've been enjoying a wonderful summer! Absolutely beautiful and love the sigh, double sigh response it elicited. I've got a bag of apricots with no purpose at the moment, so this could be it! Thanks, Erina! I think an apricot clafouti would be divine - in fact, I'm making another this week and may use all apricots (if you aren't including juicy berries then decrease the flour to 2/3 cup, which is Julia's master clafouti recipe). Enjoy! Oh Hannah - I am so excited - I love making easy summer fruit desserts but have never tried a clafouti - might even make it happen today. I adore Julia and have had so much fun reminiscing, watching old French Chef episodes, and remembering how much my family enjoyed watching Meryl Streep's portrayal of her in Julie and Julia. Love the apricot blackberry combo! Thank you, Beth! I think you will enjoy this one - it comes together in a flash and spotlights summer fruit beautifully. I've already made two this week. All of the Julia Child festivities have been terrific! I just watched a clip of her on David Letterman and was laughing out loud. She was truly a remarkable person. I love Julia Child's clafouti recipe. It's so delicious. The first time I made it, I used cherries but Paul picked all of them out. So, I have to use other fruits now. Blackberry and Apricot sounds delicious. 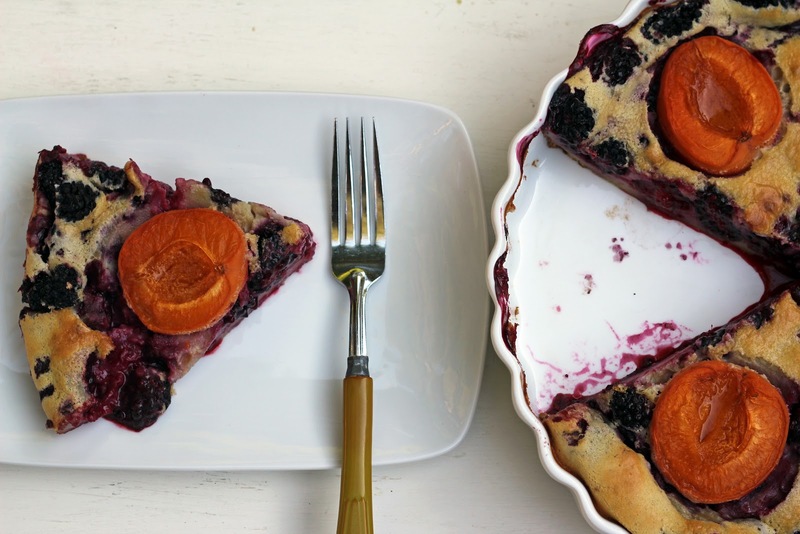 I will be making this clafouti recipe many more times - it's a classic. I look forward to trying plums and apples next. Hope you and Paul enjoy it with blackberries and apricots!